AN UNBOTTLED REBUTTAL. 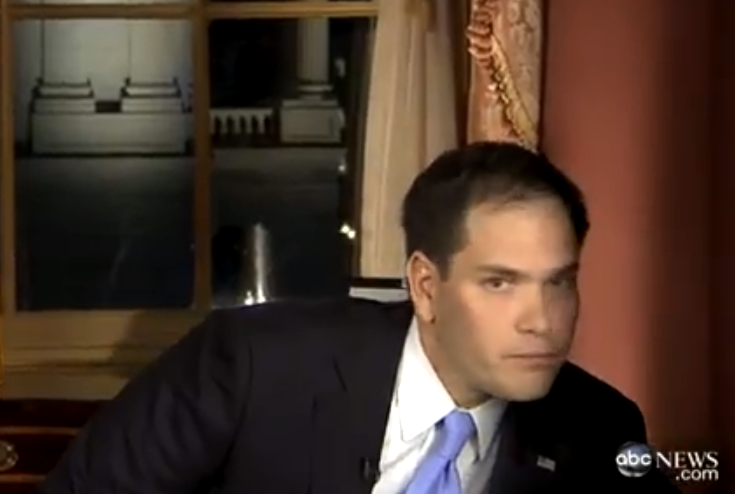 If you went to bed right after President Obama&apos;s State of the Union address last night, you missed one of the night&apos;s most tweetable moments: Sen. Marco Rubio&apos;s furtive sip of water during his rebuttal on behalf of the Republican Party. The Atlantic deconstructs it, frame by frame. * Rubio followed up on Twitter with this. * ... But Poland Spring blew its moment in the Twitter spotlight. OBAMA&apos;S &apos;MOST IMPORTANT PROPOSAL&apos;? New Republic&apos;s Jonathan Cohn says it&apos;s the call for universal pre-kindergarten. * Worth noting: Tea Party Nation blogger predicted beforehand Obama speech would be "a Hitlerian screed." HOW COPS CRACKED THE HADIYA CASE. A source tells the Tribune the break in the murder of 15-year-old Hadiya Pendleton came Saturday, from a Cook County Jail inmate. * Obama&apos;s emotional finish: Gun violence victims "deserve a vote" on legislation. CHARTER SCHOOL FOR SCANDAL. A little more than a week after the Sun-Times revealed charter school operator United Neighborhood Organization paid state money to companies owned by two of his brothers, UNO senior vice president Miguel d&apos;Escoto is quitting. * School-closings panel faces conflict-of-interest charge. NICE WORK IF YOU CAN COMMIT PLAGIARISM TO GET IT. The Knight Foundation paid disgraced reporter Jonah Lehrer $20,000, presumably in non-counterfeit money, to discuss his journalistic sins. * And he did it as critical tweets appeared on a screen behind him. * Parody website fools Washington Post into reporting Sarah Palin joining Al Jazeera. DEAD AIR. Someone hacked into TV stations&apos; Emergency Alert System to issue a bogus warning of a zombie apocalypse. * Comcast gobbling up rest of NBCUniversal. &apos;MEET ME HALFWAY. BUY A TICKET.&apos; An Off-Broadway hit, "Old Jews Telling Jokes," is headed to Chicago. Guess what it&apos;s about. &apos;PRIDE AND CONNECTIONS AND WE&apos;RE NEVER CHANGING THE NAME SO GO F--- YOURSELF.&apos; That&apos;s Deadspin&apos;s translation of the Washington Redskins&apos; defense of the team nickname "in the dumbest way possible." * [CORRECTED] Blackhawks suffer "heartbreaking" end to loss as streak without regulation losses reaches 13 games. * Bears cut Johnny Knox. * Get this blog by email. Sign up, free, here. * Next WBEZ Meyerson News Quiz: Friday morning. Try your hand at previous quizzes here.